Could a macroeconomic policy shock like the 2016 Indian demonetisation have microeconomic implications for firms? The authors investigate this question in the context of the Indian mobile phone industry. They find that in the post-demonetisation period, Chinese smartphone manufacturers gained unintended advantages in the market relative to Indian and global firms. On November 8, 2016, the Indian government announced that currency notes of ₹500 and ₹1,000 would no longer be valid as legal tender from the following day. The government and the Reserve Bank of India additionally imposed restrictions on cash withdrawals from ATMs and bank accounts and on the exchange and deposit of invalid notes for a period of time. The government’s rationale for its demonetisation move was to curb counterfeit currency, the shadow economy and funding for terrorist activities. Further, Prime Minister Narendra Modi actively promoted the use of digital transactions in his push towards a cashless economy. The sudden withdrawal of a significant proportion of cash from the economy and the prolonged shortage of new notes caused some disruptions to economic activity. Some recent studies indicate that demonetisation had adverse effects on the sale of agricultural produce by farmers at formal markets or mandis (Aggarwal and Narayanan, 2017) and on sales by retail and wholesale traders (Banerjee and Kala, 2017). These findings cover only the short-term and temporary shocks of demonetisation on sales by individuals (farmers and traders). Would we observe similar adverse effects on product sales by firms, where formal structures are in place? Is the impact on competitors within an industry heterogeneous? Does this have any effect on the market structure of industries? In this article, we use the mobile phone industry, specifically the equipment manufacturing segment, as the setting to examine these questions and contribute to the emerging literature on the effects of demonetisation. Demonetisation may have increased the demand for mobile phones either through improved awareness of the usefulness of smartphones for carrying out transactions or by making it a necessity for individuals/ households to do so. Thus, the setting provides us with an opportunity to observe the unintended effects of demonetisation through potential positive or negative pathways, rather than one where only adverse or zero effects can be expected. Second, the mobile phone industry comprises both domestic and reputed multinational firms, many of them Chinese, that cater to both the feature phone and smartphone markets in India. This will help in understanding the heterogeneous effect of demonetisation on competitors and types of products. To do this, we use an event study framework with data provided by Counterpoint Research on new mobile phones sold in India. We have data on prices, quantities and non-price characteristics at the stock-keeping unit (SKU) level reported monthly from March 2016 to February 2017. We categorise these firms on the basis of where they are headquartered, i.e., Indian (39 firms), Chinese (133 firms) and global firms (17 firms). The mobile phone industry comprises both domestic and reputed multinational firms, many of them Chinese, that cater to both the feature phone and smartphone markets in India. This will help in understanding the heterogeneous effect of demonetisation on competitors and types of products. The Indian government has for some time now recognised telecommunications as one of several strategic sectors and has laid a roadmap to transform India from an “assembler of products” to a global leader in mobile equipment manufacturing. The industry can be divided into two segments: feature phones and smartphones. Sales of new mobile phones increased from 179 million units in 2011 to 244 million units in 2015, a per year growth rate of 7.19% (Figure 1). By June 2016, the Indian smartphone market was the second largest in the world with a base of 275 million and expected to more than double by 2020 due to the push towards 4G technology accompanied by falling data prices (GSMA Intelligence, 2016). In 2015, Indian firms accounted for 51% of units sold — a drastic improvement on the scenario in 2011 where the market was dominated by global firms. However, they accounted for only 28% of the revenue generated. This was largely because Indian firms catered to the lower price segments in the mobile phone market and relied heavily on imports of components. At the end of 2015, Indian firms had generated $4.9 billion in revenues (28% of the total market), global firms $9.5 billion (55%) and Chinese firms $3.1 billion. (17%). Of this, 71%, 90% and 87%, respectively, were from smartphone sales. From early 2016, however, Chinese firms began stepping up their presence in the Indian smartphone market, the second largest in the world. They started to invest heavily in the Indian market by establishing manufacturing assembly units, strategically penetrating offline distributor networks and online e-commerce platforms, and outspending rivals such as global tech giants Samsung and Apple in their advertising efforts. Interestingly, they are also tapping into India’s massive cricket economy; many sporting events such as the Indian Premier League as well as the national cricket team are now being heavily and exclusively sponsored by Chinese phone manufacturers such as Oppo and Vivo (Abraham, 2017). In 2015, Indian firms accounted for 51% of units sold — a drastic improvement on the scenario in 2011 where the market was dominated by global firms. However, they accounted for only 28% of the revenue generated. This was largely because Indian firms catered to the lower price segments in the smartphone market and relied heavily on imports of components. It is worthwhile noting here that mobile phones and their components in India are largely imported. This is contributing to a burgeoning trade deficit with China. This trade deficit has raised policy concerns about improving domestic manufacturing capabilities to meet the expanding local demand and to compete in the global market (Pathak, Chatterjee and Shah, 2016). We expect different demand and supply side responses to demonetisation. On the demand side, we know that about 90% of employed Indians work in the informal sector and that the majority transact in cash and do not use digital platforms. The prolonged cash shortage post-demonetisation reduced the ability of employers in the informal sector to pay their workers, which in turn created severe liquidity shortages at the household level. This combined with an environment of uncertainty and restrictions on cash withdrawals could have led households to hold on to their cash reserves or carefully prioritise their spending. These factors would have had different effects on the demand for feature phones and smartphones. We would expect an absolute reduction in the demand for feature phones due to the demand shock and reduced purchasing power triggered by demonetisation, whereas the demand for smartphones could increase as more individuals became aware of their features (e.g., access to digital platforms). The uncertainty over cash supplies during the post-demonetisation period would further increase their attractiveness. On the supply side, the primary factor is the ability of firms to absorb the demand and productivity shock impacting mobile phone sales. This will vary for different categories of firms — domestic and multinational — depending on their manufacturing capabilities, penetration of intermediaries, channel bargaining power and market position in the industry. Therefore, we expect to see heterogeneous effects among competitors, particularly between domestic and Chinese firms. The suddenness of the demonetisation announcement would have made it difficult, if not impossible, for firms to make a drastic manufacturing shift, say, switching from feature phones to smartphones to meet the expected increase in demand. However, it is still possible for firms to change or reorient their marketing efforts, channelled through their online and offline distributor/ trader network. Counterpoint researchers found that, since early 2016, Chinese firms have expanded their credit lines, which has enabled them to stock more products at online/ offline stores and increase product availability. They also introduced smartphones with better battery life, more storage space, a front camera and better features to make them more attractive to consumers. Chinese firms were leveraging their experience in their own domestic market to facilitate their expansion in the Indian market. Chinese firms were in a favourable position to exploit the cash shortage among mobile distributors to aggressively promote their products. 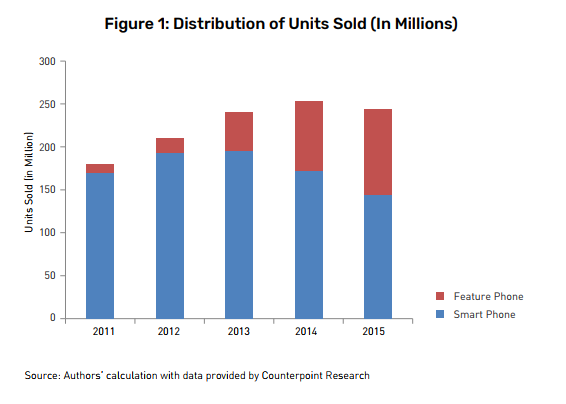 The increased demand for smartphones would be an added advantage in extending their presence. Other firms were catering to their own market segments: Indian firms to low-income households, with a focus on feature phones, and other global firms to mostly middle- or high-income households or individuals who had already transitioned to the smartphone segment. Therefore, Chinese firms were in a more favourable position to exploit the cash shortage among mobile distributors to aggressively promote their products. The increased demand for smartphones would be an added advantage in extending their presence. In our analysis, we expect to see an increase in the sales of Chinese smartphones, a drastic fall in the sales of Indian firms and no significant change in global firms’ sales during the post-demonetisation period. Post-demonetisation, feature phone sales from Indian firms reduced drastically to 4.68 million units in February 2017, about 0.68 times the number of units sold during October 2016. Smartphone sales by Indian firms also showed a declining trend, in sharp contrast to the growth seen by Chinese and global firms. The demand-supply factors suggest the following hypotheses: (a) increase in sales of smartphones, (b) reduction in sales of feature phones, (c) no adverse effect on mobile phone sales as a whole, since it is possible that a reduction in feature phone sales would be compensated by an increase in smartphone sales and (d) an increase in numbers and sales of Chinese firms, especially smartphone sales, relative to other firms. Total mobile phone sales in India stood at 25.69 million units in October 2016, falling by 16% to 21.33 million units in November 2016, the first month into demonetisation. At the end of February 2017, only 18.16 million units were sold, 78% of the monthly average of the pre-demonetisation period from March to October 2016. The effect of demonetisation is more pronounced on feature phone sales than smartphone sales. The market share of feature phones, in terms of units sold, declined from 59.56% in October 2016 to 47.87% in February 2017. Within our sample, per month sales of feature phones declined dramatically by 3,738 units for global firms, 1,210 units for Chinese firms and 879 units for Indian firms post-demonetisation relative to the pre-demonetisation period. On the other hand, smartphone sales per month increased by 2,520 units for global firms and by 13,810 units for Chinese firms. The sharp decline in sales in the wake of demonetisation has been somewhat cushioned by the recovery made in the smartphone segment during December 2016 to February 2017 by both Chinese and global firms. This is despite the fact that global and Chinese firms charged more for their smartphones, about $397 and $170 per phone, respectively, compared to $333 and $160 in the predemonetisation period. Indian firms experienced an overall decline in sales despite an increase during December 2016 and January 2017 (Figure 2). Post-demonetisation, feature phone sales from Indian firms reduced drastically to 4.68 million units in February 2017, about 0.68 times the number of units sold during October 2016. Smartphone sales by Indian firms also showed a declining trend, in sharp contrast to the growth seen by Chinese and global firms. We further computed the feature phone to smartphone sales ratio of these three groups of phone manufacturers in the market. The feature phone-tosmartphone sales ratio for domestic manufacturers decreased from five during the pre-demonetisation period to four in the post-demonetisation period. But their sales ratio was still considerably higher than global and Chinese firms with ratios of about 1.4 and 0.2, respectively, post-demonetisation. 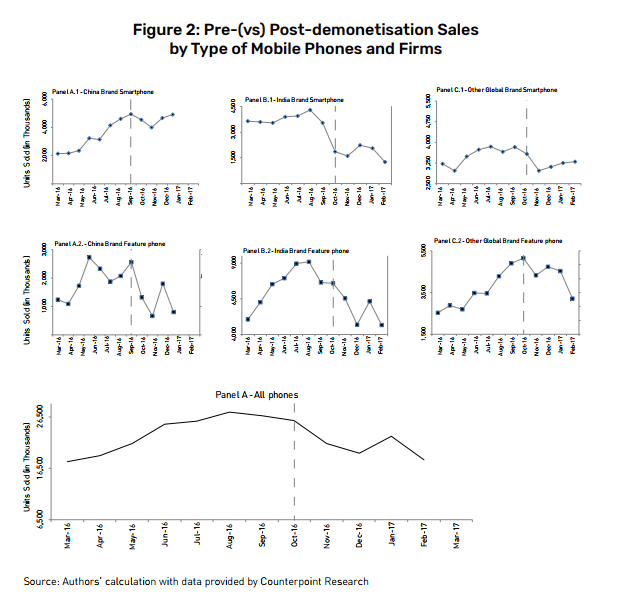 We find that the demonetisation shock in November 2016 is associated with an immediate negative effect on overall sales of mobile phones in India. When we consider a longer period, that is, four months post-demonetisation, our estimates show that this effect has been heterogeneous in nature. Relative to Indian and global firms, average Chinese smartphone sales increased by more than 100% postdemonetisation. Given the estimation strategy in our analytical model, there might still be omitted factors that will prevent us from causally claiming an effect of demonetisation. We cannot definitively conclude that a policy aimed at increasing cashless and digital transactions, and curbing illegal cash and terrorism financing has had the perverse effect of damaging Indian firms and elevating foreign competition, specifically from China, in the mobile phone market. But it can be argued that demonetisation has certainly been associated with a decline in market share of Indian firms, and in Chinese firms exploiting the uncertain conditions to change the market structure and gain a more dominant market position. More broadly, while we provide the first evidence of the effects of Indian demonetisation on one of its strategically significant industries, the unintended effects may not be limited to mobile sales and could impact other sectors such as healthcare, pharmaceuticals and agriculture, an investigation of which is merited in future work. In the long run, the implications of our findings for domestic innovation in India’s phone markets is worth examining too, besides the serious strategic and security concerns over privacy and hacking raised recently in India with regard to Chinese phones (Doval, 2017). Finally, we do not take a stand on whether Indian policy towards its mobile phone markets need necessarily be protectionist. That said, it is also important to acknowledge that the rise of Chinese manufacturing competence in mobile phones might have been realised through state protectionism (Gilbert, 2015). Given that the Indian government is trying to incentivise technological change and encourage the diffusion of mobile phones as the goto-device, it is important to analyse the pros and cons of its macroeconomic actions on the micro industry structure of the mobile phone market more carefully before ushering in policies in its push towards a “Digital India”. Abraham, D (2017). “Vivo, Oppo, IPL and the Chinese Invasion of Cricket”, The Hindu, July 5. Retrieved from http://www.thehindu. com/thread/business/vivo-oppo-ipl-and-the-chinese-invasionof-cricket/article19215769.ece. Aggarwal, N, and S Narayanan (2017): “Impact of India’s Demonetization on Domestic Agricultural Markets,” Working Paper, Indira Gandhi Institute of Development Research, Mumbai. Banerjee A, and N Kala (2017). “The Economic and Political Consequence of India’s Demonetisation”, VoxDev. Retrieved from http://voxdev.org/topic/institutions-political-economy/economicand-political-consequences-india-s-demonetisation. Doval, P (2017). “Govt Fears Chinese Phonemakers may be Stealing Info, Sends Them Notice”, The Times of India, August 17. Retrieved from https://timesofindia.indiatimes.com/business/ india-business/govt-fears-chinese-phonemakers-may-bestealing-info-sends-them-notice/articleshow/60084488.cms. GSMA Intelligence (2016). “The Mobile Economy: India 2016”. Retrieved from https://www.gsmaintelligence.com/research/?file= 134a1688cdaf49cfc73432e2f52b2dbe&download. Pathak, T, C Chatterjee, and N Shah (2016). “Maximizing Local Value Addition in Indian Mobile Phone Manufacturing: A Practical Phased Approach”, Working Paper, IIM Bangalore. 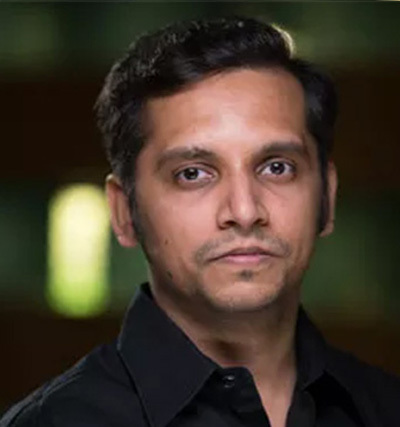 Chirantan Chatterjee is Assistant Professor in the economics and public policy area at the Indian School of Business where he is also Research Fellow at the Bharti Institute of Public Policy and Max Institute of Healthcare Management. 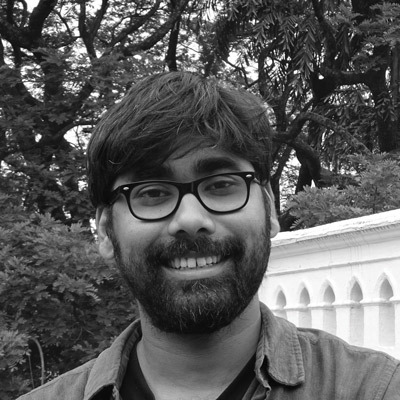 Shreekanth Mahendiran is a Research Advisor at Center for Budget Policy Studies, Bangalore. 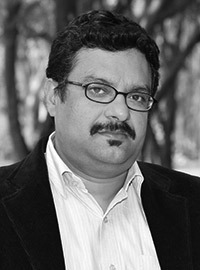 Neil Shah is a Partner and Research Director at Counterpoint Research.